I love being a part of this fantastic group of food bloggers, the Kosher Connection. Each month, we are challenged to cook up some wonderful and unique foods. Each link-up is fun and new. I love seeing the assortment of goodies that the group comes up with. This month was especially difficult. We were tasked with a Chopped style challenge. Like the popular Food Network show, we were given three ingredients to build our dish around. For the most part, we had free reign, but the dish had to include canned corn, pears and Mike & Ike candies. I had a very hard time coming up with something for the dish. Creating something that involved all three ingredients was super tough. I had initially planned a tofu dish that included a Korean pear based sauce. My husband nixed the idea in favor of something fried. He urged me to make a fritter. I don’t really like frying things, but with Chanukah coming up next month, I decided that if this worked out, it would be perfect for Chanukah. It’s traditional to have fried foods to recognize the miracle of the oil in the ancient temple. 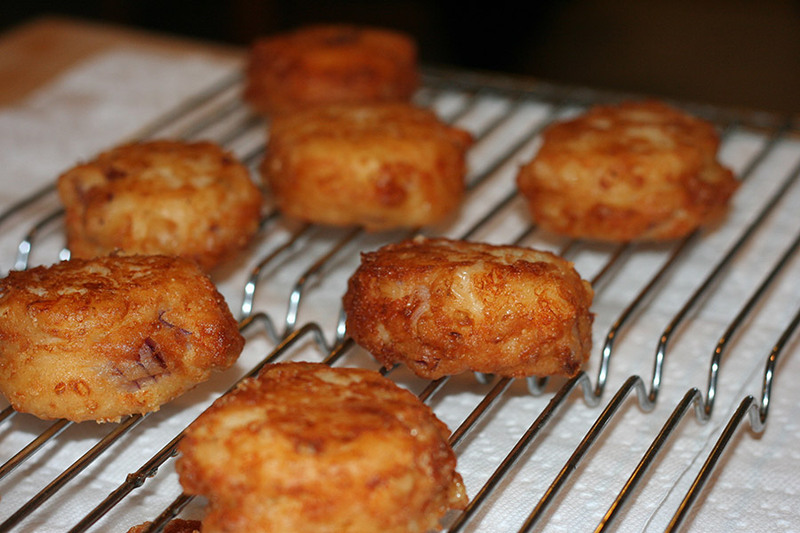 He suggested some sort of latke, but as I brainstormed a bit, I settled on a fritter. I know, not that far off. But there is a difference. I scribbled a slew of ideas on paper. Once I had the house to myself though, I got to work. I settled on a corn and cheese fritter when I saw a brick of pepper jack cheese sitting in the fridge. I quickly picked up a carton of buttermilk at Trader Joe’s and worked out a quick fritter recipe. The fritters did not disappoint! 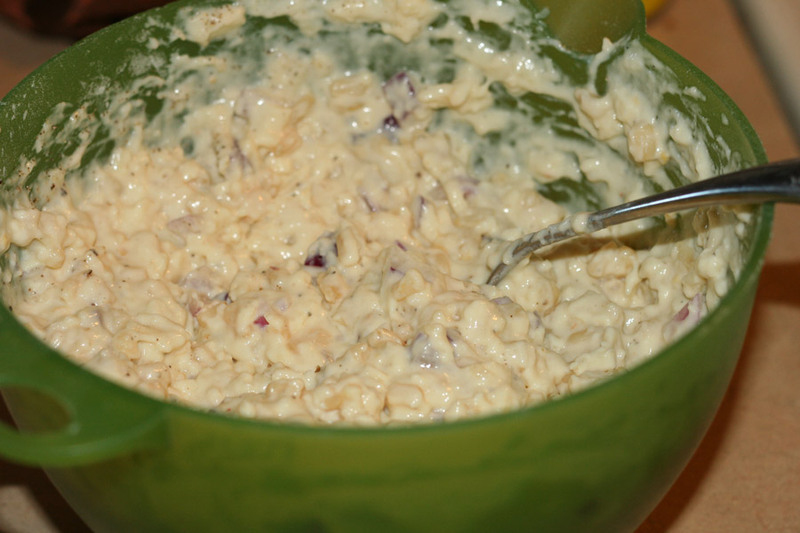 I mixed up the canned corn with the cheese, some chopped onion, spices, buttermilk, eggs, flour and baking powder. I scooped them up and fried them in a couple of inches of hot oil. I then drained the fritters on a cooling rack with paper towels underneath. Incorporating the Asian pears and the Mike & Ike candies proved more challenging. I wanted a pear chutney to dip the fritters in to. 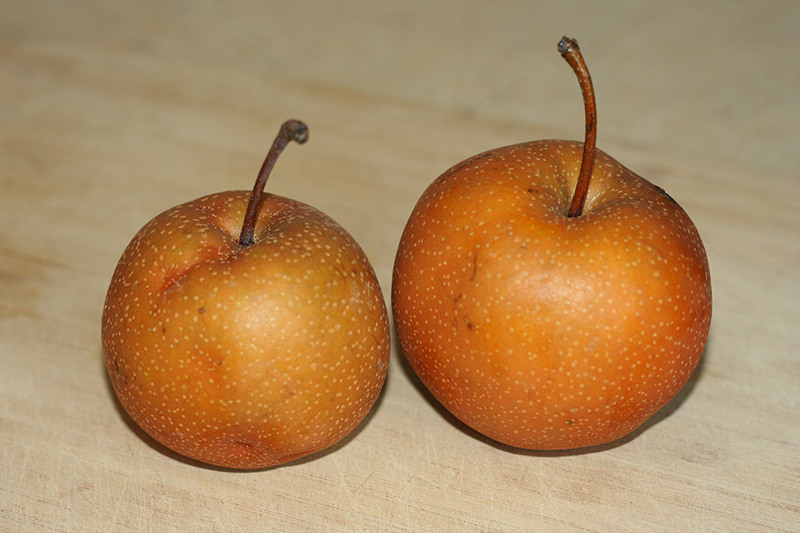 I peeled and chopped up the asian pears and began cooking them down with some ginger and water. I also added the Mike & Ike candies to let them get infused with the candy flavor. When tasting the sauce, it was definitely too sweet. I knew that it needed something savory along with some heat. I added some chopped jalapeño, onion and vinegar and cooked it a bit more. Once everything was softened, I pureed the mixture with my immersion blender. While the pear and Mike & Ike salsa isn’t perfect, it’s getting there. I call it a work a progress. To be honest, I will leave the candies out the next time I set out to make this dish. It was definitely fun to try my hand at this though. 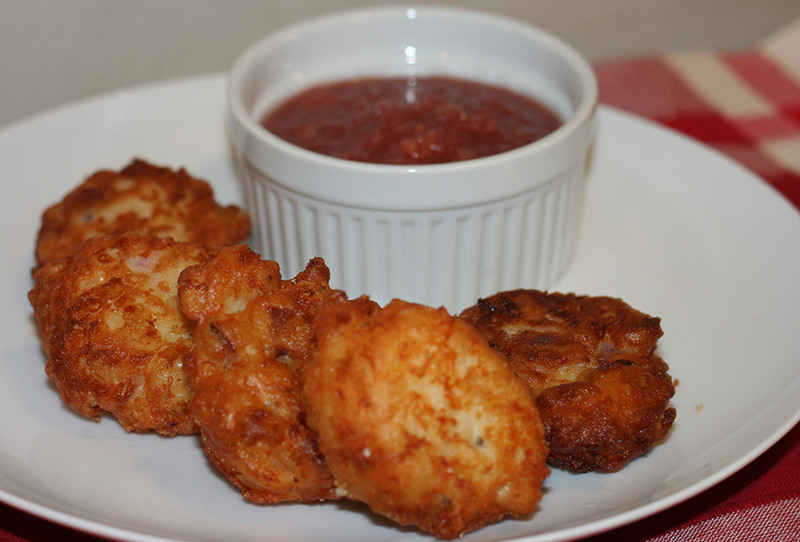 The fritters have gone on the short list though and will definitely be made next month for Chanukah. The crunch and light outside and the creamy cheese filling. One word. Amazing! Make them now! Disclaimer: The pear salsa was made as part of the chopped style challenge. I highly recommend you make the fritters. The fritters are amazing. I’m not quite sold on pear salsa with mike & ike candies. I do recommend a pear salsa without the candy! 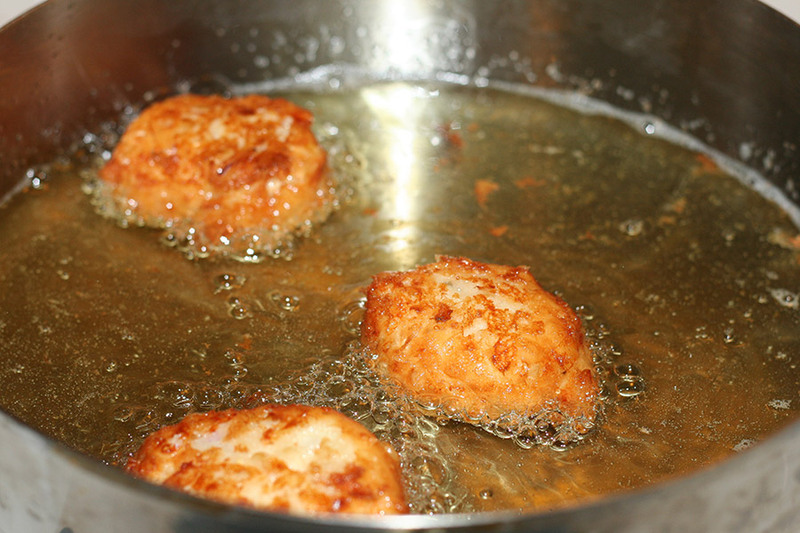 Mix all of the fritter ingredients, except for the vegetable oil, in a mixing bowl. Heat up about 2 inches of oil to 350 in a heavy bottomed pan or pot. Scoop a couple of tablespoons of fritter batter. I used an ice cream scoop. Drop in the hot oil and fry about a minute or two per side. Flip the fritter when browned. Place in a saucepan with the water, ginger and the mike and candies. Add in the onion, jalapeno, vinegar and spices. Once softened, blend with an immersion blender. This is a brilliant idea!! your corn fritters look delicious. It’s so creative how you incorporated all three ingredients into one dish! Oh, too bad the candies didn’t work even with the spices from the jalapeno, but it sounds fun. Glad to see you try. it was totally fun to do. The fritters were still great. I love, love, love corn fritters. Can’t wait to try this recipe! Yum, those fritters sound great! Great idea! Those fritters look awesome! I really enjoyed reading the steps on how you developed this recipe. The fritters sound delish!